I adore China Glaze’s Ruby Pumps at Christmastime (me and everyone else) but I didn’t want to wear it quite so full on until a bit later in the month. I decided to pair it up with a black creme for a little more subtlety. Can you tell I’m still loving the whole dark nails thing? HJ Manicure sent me a couple of their mini polishes to try and one of them was this rather basic black called Midnight. Basic = a bit boring yes?… but basic also = essential… hmmm… like leggings! (stay with me, this analogy will make sense)… You want your leggings to be opaque, easy to pull on and look fabulous on the backside right? Well, Midnight is your favourite pair of leggings. It’s a beautifully glossy creme which is a solid 2 coater and really easy to apply. I probably wouldn’t wear it on it’s own but combined with a coat of glitter (a fantastic jumper dress – see, this analogy is my best yet) it’s a total knockout. The first picture doesn’t actually do this quick and easy mani much justice, I wore it up to London and had many nice comments on my ‘lit from within’ stumps. (Grow, grow, grow!) The most realistic impression comes from the little finger in the top picture… you can see the red glow within the black base… see how it’s almost opal like. The other fingers unfortunately make it look a bit gritty which it totally doesn’t. Have you been wearing any combinations? Do you like pairing polishes up with a great black base? Give me some ideas! 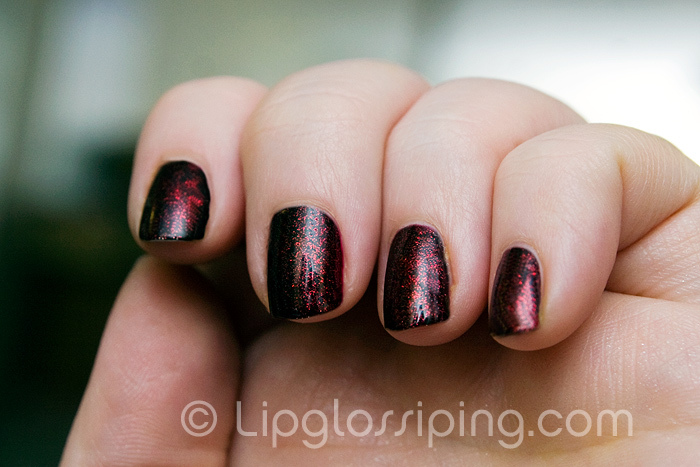 It really did look amazing in the flesh, a rich redblack shade, you barely noticed it was a glitter until you were close to. I think I NEED Ruby pumps now. So pretty! I want some new nail varnishes because I fell out of the habit of wearing it.. but whatever I ever buy always seem to chip off at the slightest bit of hand movement! Oh that’s gorgeous. I need to stop biting my nails and fingers so I can wear pretty nail polish. I have already gone for the full on red glitter, festive nails. Hurrah! Love this look! And it is so great to mix black with lighter polish to get that twisted look! Nice nice nice! Me Likey! I really really like that. Might have to invest in Ruby Pumps. Everyone raves about it. i have ruby pumps on right now (i forget how this color makes me feel…so sparkly! ), but this is just great. it’s dark and christmas-y in a very good way. I LOVE nail polish. Unfortunately I work in a kitchen where we cant wear nail polish because of the chipping factor and it getting in the food. That’s lovely!!! (not as lovely as your analogy, of course ;)). I rarely layer different polishes cos I’m too lazy and I smudge stuff straight away, but I’m very tempted having seen this, it’s gorgeous! That looks really fab. Must grow my nails! Oh this combination is divine! That looks like China Glaze Lubu Heels. Just saved yourself £8.00 there, lady. And you read my mind. Colours over black – check today’s post on Nice Things! Love that. I do like the black polish, it’s very good quality.